Real Madrid dropped two vital points in the fight for La Liga as they drew 1-1 against Malaga. Barcelona increased their lead on the table to nine points, leaving Los Blancos with little hopes of conquering the title. Cristiano Ronaldo opened the score and missed a penalty that could have secured the victory, but the hosts ended up levelling with a goal from Raul Albentosa. Both teams fought hard from the start to gain control of possession. The visitors look more threatening in the last third and had the first chances to score. Kameni denied Jese Rodriguez brilliantly after the Spaniard received a super pass from Mateo Kovacic and fired an effort from a narrow angle. Malaga gained confidence and had two major opportunities to open the score. Juanpi took advantage of a poor mistake from Kroos to advance one-on-one with Navas, but hit straight at the stopper. In the next play, Horta arrived unmarked inside the box, but hit the side-netting. Los Blancos took the lead after the half-hour mark as Ronaldo headed a Kroos free kick into the back of the net. The Portuguese seemed to be in an offside position. Ronaldo could have doubled the visitors lead minutes later as he was brought down inside the penalty area, leaving the referee with no choice but to point to the penalty spot. Yet, Kameni did wonderfully well to tip Ronaldo’s strike away from goal. Zidane men gained control of the game in the second half and were able to prevent Malaga from threatening Navas. However, right after the hour mark, Malaga found an equaliser when Madrid were more comfortable. Weligton cut into the left-hand side of the Real Madrid penalty area before cutting a great cross over to the far post, where Albentosa, who was completely unmarked, beat Navas with a struck side-footed shot. Isco had the ball in the back of the net five minutes later, as he received a pass from Kovacic and converted from close range, but the Spaniard was ruled offside. 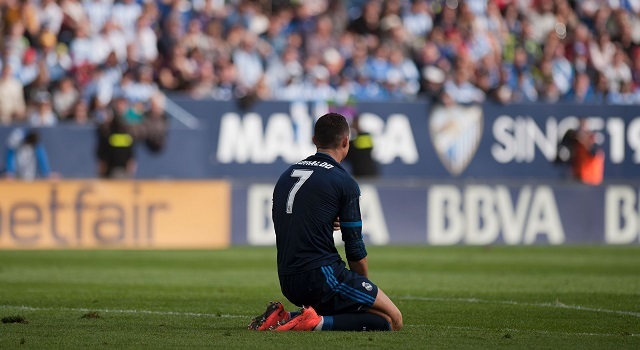 Los Merengues were unable to level before the end and dropped two crucial points in the fight for La Liga.